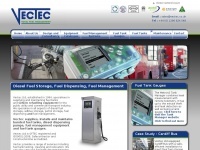 Vectec specialises in all aspects of diesel fuel storage, fuel dispensing, fuel management, fuel tank gauges and bunded fuel storage tanks. Vectec supplies a large range of refuelling equipment parts and accessories and spares. The websites author and copyright owner is Vectec.